No, not for the old wrestling show, but for the World Wildlife Fund. Found this on the "I believe in advertising" blog here by agency Lowe GGK out of Warsaw, Poland. 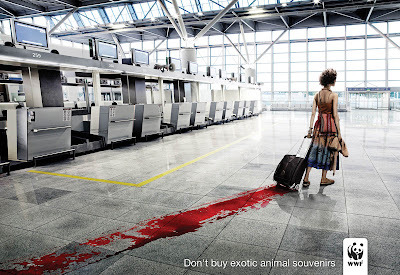 The ad obviously speaks for itself, I just thought it was a great way to communicate how such a simple idea of buying a souvenir in a foreign country could be at the cost of killing an innocent animal. I know this struck a cord with me even though I've never thought about buying an ivory sculpture, or some kind of bone necklace, or monkey hand, or something crazy like that. I'm not necessarily a fan of the style of photography or the excessive photoshopping done. I feel it could have been a bit more "raw" if they laid off the airbrush a bit, but that's not the point. It grabs your attention with the blood, and hits home with succinct copywriting.